Every business should have a way to visualise the work that needs to be done, and to keep track of progress. This allows work to be planned in advance, and lets you see where tasks are falling behind, or need some help from higher up to remove obstacles that get in the way. Kanban boards are the sunlight to fight the process waste vampires. They provide a whole new perspective on how the business is running and where to focus to make it better, and they let you keep track of what’s being done if you decide to spend the afternoon at the beach. In its simplest form, a kanban board divides a list of tasks into three sections: ‘to do’, ‘in progress’ and our personal favourite, ‘done’, as the example from Wikipedia below shows. 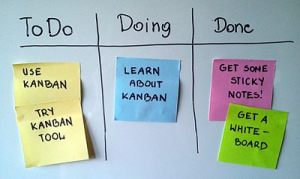 The easiest way to set up a kanban board is with a whiteboard and sticky notes, and there’s also a large number of, inexpensive online tools that provide this basic view, along with a host of other powerful functionality. Good examples of tools that we’ve found useful include Trello, Jira, Smartsheet and Leankit. We use kanban boards every day to manage daily tasks, monitor progress on large projects, and track the work we assign to our outsource partners. Using kanban boards to visualise all of our tasks in one place saves a huge amount of time in planning and managing work. How can they be used in practice? The key to making the best use of your kanban board is a practical visual manage system that does what the particular business needs. It’s simple to set up and can lead to massive improvement in how the business functions. We borrow a lot of general principles from the ‘Scrum’ approach, a project management method that relies heavily on the use of kanban boards. It’s roots are in software development, but its general principles can help any business manage and track tasks better. 1. Add all future work currently on the radar to the backlog of tasks, in the ’to do’ section. 2. Prioritise the backlog so everyone can see what needs to be done next and in what order. 3. Work within defined time periods (for example the next two weeks), and set expectations for which tasks will be completed within each period. 4. Team members take tasks from the backlog and work to complete them. 5. Hold regular, quick meetings (ideally every morning) with everyone involved to discuss progress and discuss how to remove roadblocks. 6. Reflect as a group at the end of each period toward on what went well and what to do better next time. Obviously the system you decide to use . Get in touch if you want to talk about how to make it work for you.